Comments Off on Fitness Testing for Triathletes—How Do You Measure Up? A foam roller is a simple cylinder (usually made of foam or flexible plastic) which you can lay on in a variety of positions, allowing your body weight to put focused pressure on affected muscle groups. One of the most popular areas to foam roll is the iliotibial (IT) band, but you can also use it on your back, hips and shoulders. Rolling over problem areas can help release that built-up tension in your fascia and re-establish the integrity (and optimal performance) of muscle tissue. The post Why, When, and How to Use A Foam Roller appeared first on TrainingPeaks. Scott Burns is a 42-year-old amateur marathon runner from the UK, who has been training seriously for the last five years. Until this season he had been using an online algorithm to define and manage his training—but was growing frustrated with seeing minimal improvements in his fitness and race results. 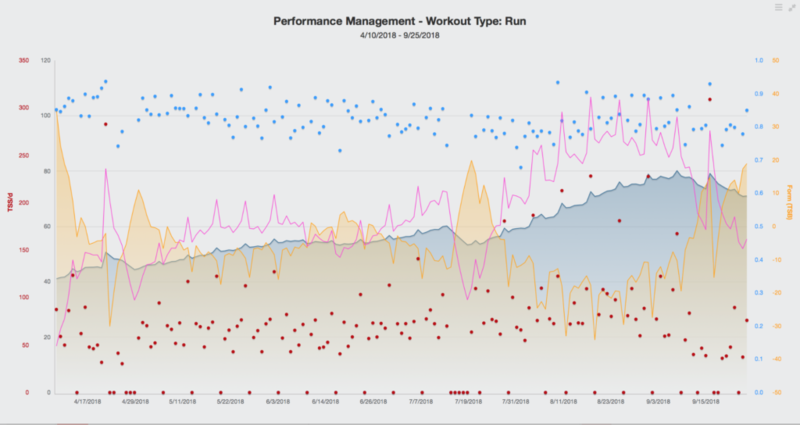 We connected via CoachMatch, and began to work through applying my Zone 2 methodology to his training through TrainingPeaks. Scott ran a 3:33 in October 2017 at the Reykjavik Marathon, and ultimately blew past his goal of breaking 3:30 with a 3:08 just 13 months later in Berlin. Here are some of the major factors in his success. Zone 2 Training is focused on the idea that your zone 2 days are just as important as your hard Zone 4 and Zone 5 workouts. Running in Zone 2 facilitates active recovery, and allows you to build your base. Metabolically it also teaches your body burn primarily Fatty Acids, helping you maintain a steady effort for a long time (unlike the surge-crash cycle of carbohydrate fuelling). This sort of fat-adaptation is popular and effective among the marathon and ultra-endurance crowd. Once we got started, Scott was able to steadily increase his chronic training load (CTL) and began having breakthrough after breakthrough. As you’ll see in the 13-month progression below, Scott was able to steadily turn up the intensity at each race while maintaining the same average HR, ultimately dropping over 1min/mile off his pace (and an average of two minutes per month off his marathon time). Scott’s peak ultimately consisted of a 110 km (66 mile) week, three weeks out from race day. This pushed his CTL to 76, and an eventual 81 the following week, with a total accumulated TSS of 730 (of a planned 765). Broken down, this week was comprised of three aerobic days, two workouts and a special block on Saturday with a full rest day on Sunday. 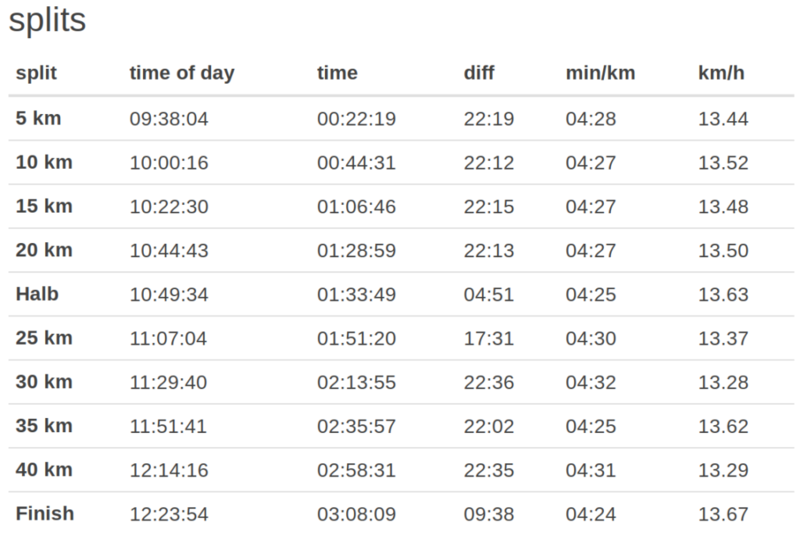 Workouts were 6x 1km @ 3:53-3:44 min/km (6:14-6:00 min/mi) and a 10km progression from 4:27-4:02/km (7:10-6:30 min/mi). Scott also followed a consistent strength maintenance program twice a week, for a total of around nine hours total of training that week. Using Half Marathons late fall and early spring allowed us to test fitness without going through the extensive recovery required of a marathon. These shorter races allowed us to continue building a base and working through a series of hills, intervals, and extension workouts. London Marathon was quite hot and the plan for a 3:10 race was out the window by 30km—but Scott adjusted his race plan and managed a 3:14. Scott peaked just in time for Berlin, allowing for a perfect 10-day taper. Take note of the steady increase from London (CTL: 72) at far left to the peak at Berlin (CTL: 80). This time frame includes time off for medical procedures, a seasonal break and a full build to a peak and taper. One of the biggest factors in Scott’s success was his extensive use of tempo efforts of 10-12km, progressing from goal marathon pace to goal half marathon pace. Starting below his fastest pace allowed him to settle in on a sustainable pace very early in the race; his legs were locked in. Take note of the .42% pa:hr. his heart rate stayed impressively consistent over the course, and remained closely aligned with his pace. As pace is broken down, we can see that consistently hitting his marathon pace in training allowed for flawless execution on race day. A 151 HR average allowed Scott to stay just outside of Zone 2, progressing slightly into Zone 3. By using disparity training we were able to execute a comfortable and intentional effort in Zone 3. Dive into his splits and we can see how well the Zone 2 methodology pays off on race day! The over/under on his 5k splits was ~:20. This shows that Scott knew exactly how the race should feel at goal pace. That sensation was ingrained early on in his training and repeated weekly or biweekly with specific endurance or extensive tempo workouts. In his build up Scott only ran 3 workouts of 10km at race pace, with 2 workouts of 10km on back-to-back days during his peak week. Scott’s improvement is a direct factor of his hard work and diligence in training; he only missed a total of 7 workouts in 13 months. For his effort, Scott earned a 25 minute PR. Scott now has his sights set on taking his marathon time into the sub-3-hour realm in 2019. Congratulations to all Berlin Marathon runners on a successful and record-setting day! Ed. note: athlete’s name has been changed to protect his privacy. The post Data Analysis: Shaving 30 Minutes Off A Marathon PR appeared first on TrainingPeaks.